According to a recent New York Times article, 43 precent of employed Americans surveyed worked remotely at least some of the time. And if you look at entrepreneurs or solopreneurs, this number would be much higher. Working from home can be incredibly different from the “typical” work environment, and poses unique opportunities and challenges. After working from home for about 18 months, I’ve learned a lot about how to get the most out of every day and stay sane while doing it. 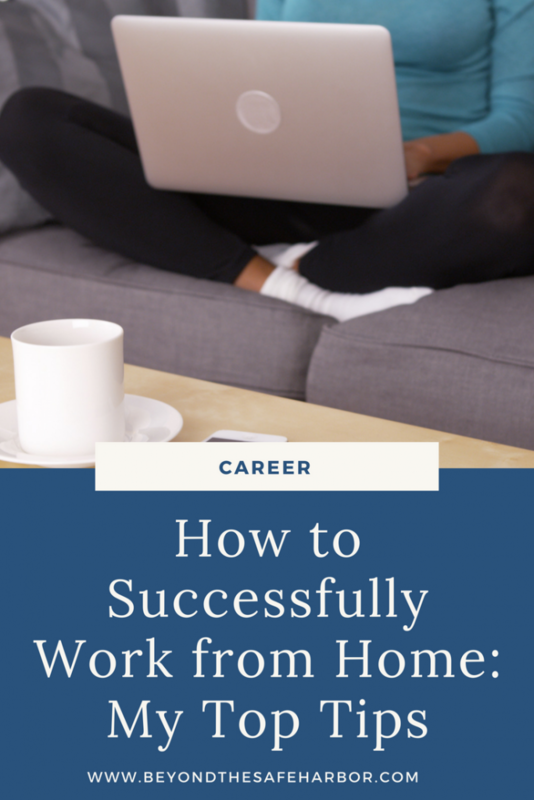 Here are my best tips for how to successfully work from home. Create (and stick to!) a plan. If you’re a solopreneur or entrepreneur, this is essential. Whether you create a formal, annual business plan or plan in shorter time spans, the key is to form a big picture strategy and then execute it. Without zooming out and looking at your business strategy more broadly, you’re likely to spend your time focusing on the wrong things. I plan in 12-week blocks, much in line with the thinking behind The 12 Week Year by Brian P. Moran (which I highly recommend!) By planning a quarter at a time, I’m able to be more flexible and adapt to the changing seasons of my business. It gives me enough time to get important things done, while also a short enough time span to create a sense of urgency. Whichever approach you take, create a plan, and use this as your blueprint for how you spend your days. If you work from home working for someone else, it’s still important that you and your manager get on the same page with respect to your goals and priorities so that you can work towards them. Once you have your business plan or strategic plan, create weekly priorities. I do this naturally as part of my 12 Week Plan, but you could even tackle this on a monthly basis. For the next, say, 4 weeks, what do you need to accomplish every week? I find it helpful to have a list of goals or priorities and then map them out by week. Here’s a snapshot of how I do this. While it shows a look back at what I’ve completed, it still paints a picture of how the set up looks. Check out my post How to Write Goals You Can Actually Achieve for inspiration on setting the right types of priorities. Every Friday afternoon, I sit down and map out the coming week. I start by entering any known plans and commitments that I need to work around. Then I create time blocks for the key priorities, placing them where they make the most sense in my calendar. I even add time blocks for cooking dinner, doing meal prep, working out, and personal plans. This way, come Monday morning, I have no doubt what I should be focusing on. Every day, I boot up my computer and have full clarity on what I need to be doing. And because my calendar is mapped to my priorities, I get all my goals done every week just by executing against my plan. Looking for more guidance on how to use time blocking? Check out my post How to Create a Time Block Schedule to Get More Done. Tackle the most critical things first. Working from home can be ripe with distractions, from phone calls to deliveries, to simply wanting to wander over to the fridge for your eighth snack of the day (I’m not judging!) Things come up, priorities shift, and curveballs need to be addressed. In order to better your chances of getting the most important things done, tackle them first. For example, content creation is one of my biggest priorities, so I write new blog posts as one of my first tasks of the day. This gets it out of the way, when I’m sharpest and feeling most creative. While there are certainly productivity tips that work for most people, not all of us have the same productive times or patterns. Get to know your most productive times and work with them. If you’re a night owl, shift your schedule to accommodate this. Don’t feel you need to conform to a 9 to 5 schedule if that’s not when you’re at your best. Just because you’re working in a more comfortable, relaxed environment doesn’t mean you won’t get burnt out. Schedule in regular breaks throughout the day to get up from your computer, get moving, and give your eyes (and mind!) a break. Along the same lines as taking a break, try to get out of the house a few times a week. This will depend on several factors including access to transportation, and what your schedule looks like, but the key is to make it a regular occurrence. We only have one car and my husband takes it almost every day to drive to the train station, so I have to make a concerted effort. Typically one day every week or other week, I’ll take the car for the day and run errands or go to an appointment. And during the week, we’ll do something out of the house at least once or twice in the evenings, even if it’s just a trip to the grocery store. This keeps me sane and caters to my extroverted side! One of the biggest perks of working from home is that in most cases, you can wear whatever the heck you want. As I’ve shared before, I LOVE wearing cozy thermals and loungewear around the house. They are supremely comfortable, and make me feel relaxed and able to focus on the task at hand. I used to wear business casual dress every day, and while I love dressing up, the pain of high heels or the irritation of avoiding wrinkling a skirt added distraction. If you work from home, take advantage! Wear clothes that make you feel good and comfortable. Did any of these tips resonate with you? If you work from home often, how do you make the most of your time? Sound off in the comments and let us know. And be sure to check out my post Advice for Entrepreneurs: My Top 5 Lessons Learned for more business tips.